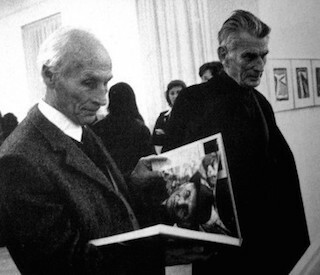 Bram van Velde and Samuel Beckett, Galerie Maeght, Paris, 1975. We are seeking contributions for a volume on Samuel Beckett and contemporary art to be published by Ibidem Press, distributed by Columbia University Press, as part of their new Beckett in Company Series. We aim to collect essays on the intersection of contemporary art and the drama, poetry, and prose of Samuel Beckett as well as interviews with and new documentation by working artists who draw upon or are inspired by Beckett’s work. We are not seeking essays that cover Beckett’s study of painting, his art criticism, nor his connection to modern artists of the first half of the twentieth century. We hope this collection will open new ground in Beckett studies and in the study of contemporary art by tracing Beckett’s influence in the work of artists post-1945 until the present day. Explorations of Beckett’s formal experiments in drama, poetry, prose and other media as contemporary, parallel revisions of modernism’s theoretical presuppositions congruent with trends like Minimalism and Conceptual Art. Please send abstracts detailing your proposed essay or interview. If proposing an interview, please indicate whether the artist-in-waiting has already agreed to the interview. Please send a 300 word abstract, a brief bio, and any questions to: reginio@alfred.edu by 1 November 2015.